So let’s get to tasting. On the nose, Hand of the Queen is rich and malt-forward, with a complex blend of toasty, bready, toffee, nutty and even slightly roasty influences. Hops are minimized—this is more of an English than Americanized barleywine—but there is a nice undercurrent of orange marmalade throughout that is probably at least partially hop derived. All in all, I really dig the interplay of toasted bread, honey and dried dark fruit notes. Very nice. On the palate, Hand of the Queen is deceptively smooth—deceitfully smooth, really—hiding its booze like Tyrion would hide a secret. Deeply toasted malt is predominant, slightly more “toasty/nutty” than overtly caramelized, although there’s plenty of the latter as well. Subtle red fruitiness is threaded throughout with hints of black cherry/grape, which gives it a sort of brandy-ish quality. Hops are again minimized, so don’t go expecting an American-style barleywine that blurs the lines with DIPA. Burnt sugar notes creep in intensity with repeated sips, and citrus that reminds me of the flamed orange peel you’d get in a cocktail—the whole thing is like a very rich old fashioned made with a bready-tasting wheated bourbon. Another thing I enjoy about it is the lack of the typically aggressive Ommegang Belgian yeast profile, which I think would have upstaged the malt complexity on some level. This is just a lovely malty beer, and one that never gets too overtly sweet, either. All in all, I am quite impressed with this one. 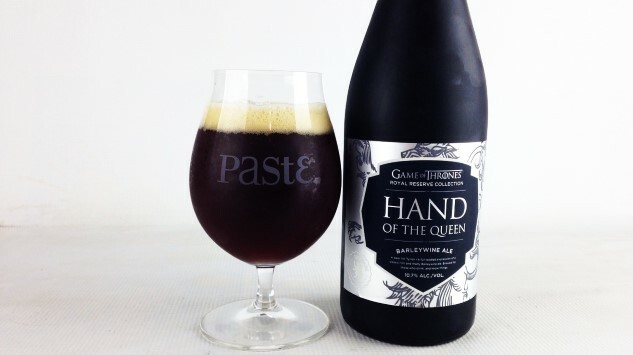 Hand of the Queen pretty easily vaults to being my favorite of the Ommegang Game of Thrones beers released so far, and I look forward to finding some more when it hits distro in April. Future releases in this series are pegged for July, October and December of 2018, but we don’t yet know how those beers will be themed. As for this one, sock away a bottle of Hand of the Queen for the show’s season 8 premiere date, which is still a loooong way off—April of 2019. Slower than an undead army of White Walkers, I swear.